I often get asked if I make up my own recipes. Most often I would reply yes, however this one today is up for debate. I had dog-eared a page in last month’s “bon appetit” for what I remembered as a recipe for a salad with lamb, seared red onion, and certainly some pomegranate seeds. Some wonderful friends were over on the weekend, and brough with them a package of ground lamb from sheep that they had raised. Pasture grazing, organic, I like to imagine happy sheep. Perfect, I had a pomegranate languishing in the crisper, when does anyone just happen to have a pomegranate on hand? So it was predestined, I had to make that recipe. Only hitch was, it was a stir fry not a salad. Using lamb shoulder, nestled on a bed of rice with a side of greek yogurt. Really? That’s not what I remembered. So it quickly morphed into Salad with Ground Lamb, Seared Red Onion and Feta. Now I wonder, does that count as following the recipe? Set large preferably cast iron skillet over medium high heat for 2 minutes, add 1 Tbsp of olive oil, heat 1 minute or so then add the red onion and cook stirring occasionally until browned approx. 5 mins. Remove to plate and add lamb to pan, cook breaking up with wooden spoon until throughly cooked through and it is beginning to brown. Return the red onion to pan and toss with lamb, once warmed add garlic and spices stirring to incorporate. In the meantime add spinach to salad bowl, sprinkle with salt and pepper then add a few Tbsp of olive oil around the outside of the inside of bowl and toss well. Line dinner plates with the dressed spinach, spoon a generous amount of lamb onion mixture to the center of the plate, top with feta. Scatter the pomegranate and radishes all over and add fresh herbs. This should be on the menu of a fine restaurant…I would just eat this for lunch! Yummy! 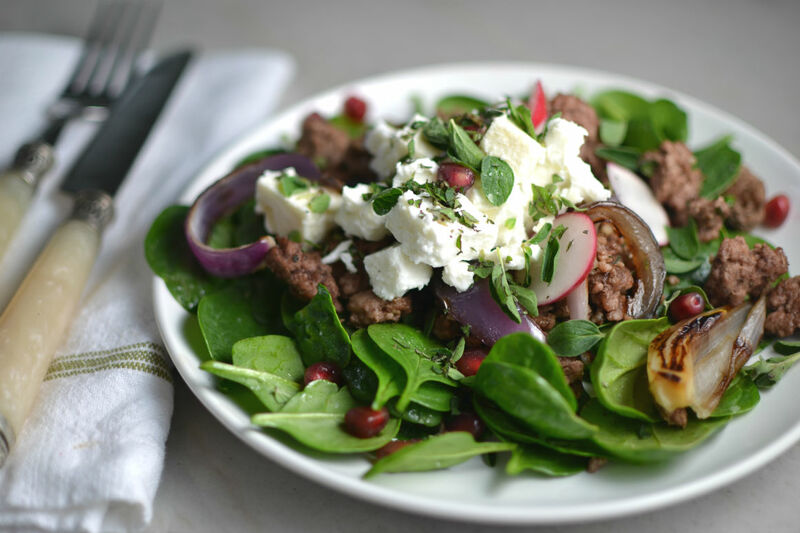 Love lamb, great idea using in a salad. yummy i just might make this for easter and hello to carla!